This week is our second on the turmoil in Russia during 1917. the first revolution of 1917 was a textbook case of a spontaneous and unplanned action by a massive number of people within Petrograd, the capital city of Russia previously known as St. Petersburg. The leaders of the future revolutions, and the most famous Russians of those revolutions were barely involved, some were not even in the country. Trotsky began the year in New York, Lenin would not arrive until April. This week is our second on the turmoil in Russia during 1917. the first revolution of 1917 was a textbook case of a spontaneous and unplanned action by a massive number of people within Petrograd, the capital city of Russia previously known as St. Petersburg. The leaders of the future revolutions, and the most famous Russians of those revolutions were barely involved, some were not even in the country. Trotsky began the year in New York, Lenin would not arrive until April. This first revolution is usually called the February Revolution, but you will often see it using dates from March. I think this is something that requires some explanation. At this point in history the Russian empire was still using the Julian Calendar as opposed to the Gregorian calendar that most of the rest of the world was using, and which we still use today. This meant that in 1917 the Russian calendar, using the Julian system, was 12 days behind the Gregorian calendar. This creates some date differences depending upon whether or not the dates that you are looking at have been translated. I bring this up so early in this episode because I am going to endeavour to give all dates as Julian dates, putting most of the events happening in the last 2 weeks of February, and I will be attempting to use this on all of the dates that I give for the entirety of our series on the revolutions, but I may have missed a few. This conversion has actually been a problem since the beginning of the podcast, with my sources sometimes using different dates, making things very confusing, but this is the first time that we will have an actual event with an name after the month in which it occurred so I thought I would bring this up now. It would have all been okay if the Russians would have started their little revolution in the first two weeks of February or March, but unfortunately they did not take into account possible confusion by future historians either in February or October in 1917. I guess I should also mention that I am one of those people who believe that for the most part exact dates do not matter in history anyway. The sequence and relation of events is more important the exact date and time. That said I have attempted to be as accurate as possible in all of my dates. That is a long way of saying, if you do your own research and think I am absolutely crazy because my dates don't match up, for once I am not the one at fault, the obvious people to blame are Julius Caesar and Pope Gregory the 13th. Back to the events of 1917. The root of the problem for the Czar in 1917 was that he did not really have many people of consequence willing to stand up and defend the monarchy. The public faith in the monarch was at an all time low, with rumors of a Black Bloc within the court poisoning the Tsar's mind, this is where all those Rasputin stories come in. It was rumored that this group was seeking to make peace with Berlin. In general Rasputin's influence over policy is grossly exaggerated, but whether not all of the rumors about him are true or not is a story for another day. What matters is that this is just one reason that the people of Petrograd had almost entirely lost faith in their government. There were even some that justified the revolution as their patriotic duty because they believed that the Tsar, and those members of his court that were close to him were about to betray the country. It was mostly just another way to justify what was about to happen. The revolution would begin as a series of strikes in the last week of February, but their actual root was back in January. It was during this month, on the 9th, that a series of strikes were staged in commemoration of Bloody Sunday. It had been on Bloody Sunday that the Cossacks had been called in to brutally put down the protests during the 1905 revolution. The general unrest would continue from this date until February 23rd, International Women's Day. It would be on this day that the strikes and protests all over the city would begin to gain momentum that nothing could stop. This started as a day where the women of Petrograd began a march towards the center of the city as a way of protesting for equal rights, with a healthy mix of protests against the food shortages that continued to plague the city. 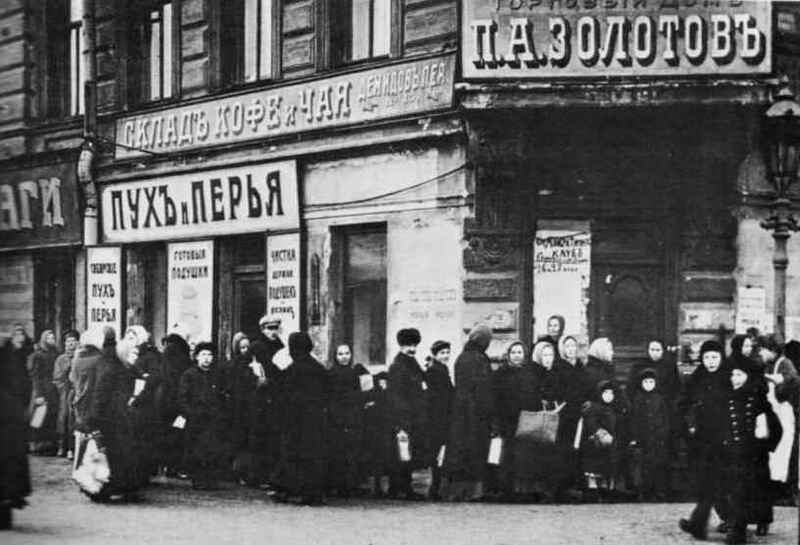 It was common for the women of Petrograd to have to line up all night to get a loaf of bread at a store, with many of them often being turned away with nothing due to the shortages. This caused the flames to smolder, but then rumors of even more food shortages began to fan the flames. By the afternoon 100,000 workers had joined in with the protesters by going on strike. The next day 150,000 workers would take to the streets to join the protests. February 25th would be something of a turning point for the movement. On that day 200,000 workers marched towards the center of Petrograd. They overwhelmed the police and military units were called in to assist. The protesters, instead of antagonizing the soldiers, began to attempt to win them over to their side. The fact that this was an even mild possibility should tell you a lot. The turning point was, and this is quite possibly an apocryphal story, on the Nevsky Prospekt. This was the center of the protests and it was also here that a young girl approached a unit of soldiers with a bouquet of red roses, roses being a symbol of both peace and the revolution. The officer in charge of the unit took the flowers, and the crowd erupted in a cheer. This was a symbol that this time, unlike on so many previous occasions, the government could no longer count on its soldiers. It might have still been possible to put down the revolution at this point, just maybe, if more food could have been delivered into the city to feed everyone it might have taken enough wind out of the sails of the protesters, many of which were still protesting the food situation, but unfortunately this was just not possible. That is not to say that there were not efforts to stop the protests. While the incident with the flowers and the girl makes for a good story it did not prevent some clashes between the military and the mobs around the city. On the 26th there were several instances of units firing into the protesters which just served to harden the resolve of the citizens. Through all of this the leadership in the city were always downplaying the situation when reporting to Czar who was at military headquarters, they did not want to admit that the situation in which they had been entrusted was slowly spiraling out of control. This prevented more military from being moved into the city early enough in the process to make a difference. It was not as if the capital was not well garrisoned though, there were already 180,000 soldiers inside the city, and 150,000 close enough to rapidly move in. However, these were not the old reliable troops that the government had depended on to maintain order before the war. The city was usually guarded by Guards regiments, very historic, very well disciplined, very reliable, with the last piece, the reliability being the most important. However, due to the atrition of the war the troops in the city in 1917 were a far cry from the old Guards who had been sent to the front, and then been replaced by troops that were far less steady and far less reliable. As the protests got more and more violent a greater percentage of these troops either refused to fire or deliberately fired above the headers of the crowd. For many others, after having fired into the crowds on the 26th they began to have second thoughts about the whole situation. These thoughts would turn into full scale mutiny on the 27th. These mutinies were often led by junior officers, many of whom came from lower class backgrounds and were more democratic in their political leanings. It seems to have started tithe Volynsky Regiment, who refused their orders and instead marched out into the streets to join in the protests. It then spread to all of the other units and within a week there were almost no loyal military units left in the capital. More than just the manpower that joined into the protests the soldiers also helped by breaking into the Arsenal and distributing the weapons from it including 40,000 rifles and 30,000 revolvers. Then they moved onto looting the weapons factories around the city, netting them another 100,000 weapons. This kicked the revolution into high gear as the revolutionaries were now armed about as well as anybody who could be sent to stop them. Another effect of the military involvement was a change in how the protesters behaved. When this all started there had been a large portion of women and young people among the masses, they were not militarily minded, they had not been well organized, and they had been more optimistic about how they could affect change on the government. Now the military units began to take control of the entire situation. They moved on the phone exchanges, railway stations, and military targets. They vastly increased the violence and level of destruction happening in the city. Finally, they just gave form the structure to the masses. They were able to organize groups around military units and use them for specific purposes and be sure that there was at least a core of people in those masses who would listen to orders and instructions. However, there still was not an overall set of leaders of the movement, preventing it from being as efficient as it could be. As I have mentioned several times already the February revolution was not led from the beginning by a group of people trying to orchestrate events. However, a group did start to coalesce on the 27th, by which point the revolution was already happening that they were mostly trying to get control of the inertia already created by the masses. They created the Provisional Executive Committee of the Soviet of Worker's Deputies and on the 27th it would have its first meeting. That meeting then led to the creation of the Petrograd Soviet of Worker's and Soldiers' Deputies, which was essentially a group of representatives elected by the various groups around the city. It was during this stage that the revolution really moved out of the hands of the workers and women who had started it. When the first session of the Petrograd Soviet met 2/3rds of the representatives were soldiers, even though the soldiers only made up a quarter of the population of the city. This was due to the simple fact that it was so much easier for military units to organize and elect delegates. However, such a large body of people had serious difficulties making any real decision since there were so many different groups involved and very little time to try and gain consensus. Therefore most of the decisions would end up being made by the Executive Committee. This took the power away from both the citizens and the soldiers and put it in the hands of just a few men who before the revolution had been leaders of various socialist groups around the city. This included groups like the Mensheviks, Bolsheviks, and other groups that will continue to play a big role in our story. Throughout of the discussions of the Executive Committee one thread ran true, the members of the Executive Committee did not want to opening come out and attempt to control the revolution. Their greatest fear was a violent counter-revolution which would seek to unseat them. Therefore, instead of trying to form and lead a real government they instead looked to the Duma to take control of the government now that the Tsar was no longer in control. The Duma had been created as part of the 1905 revolution as a concession by the Tsar as a way for the Russian people to participate in representative government, and it did have some power within the government. However, over the next decade the representatives in the body became more and more elite. This moved them away from any real connection to the vast majority of Russians, which would strain their relationship with them during the war. In 1915 there was a new collection of members within the Duma who called themselves the Progressive Bloc throughout the next two years they pushed for, and received, several compromises from the Tsar. This included the removal of some conservative ministers, however the Tsar would never go as far as they wanted when it came to progressive reforms. This gave the Progressives an excuse to focus all blame for the war on the Tsar, instead of having to take any blame themselves. This then also gave them a really good excuse for abandoning him in 1917 and siding with the people of Petrograd. However, they did not initially just swoop in and take control. Much like the Committee there were concerns in the Duma that if they tried to assert their power too early, or too strongly, there would be a backlash. They were just not sure if they could, or even could, take a leadership role in the revolution. The Duma had two options, they could seek to oppose the entire revolution, a choice that became less wise every day that the revolution continued since they could only do it if they believed they had the strength and support to overcome the people. Or they could go along, and at some point try to control and contain the masses, which was the direction that they chose. They would begin to take a more active role in the situation when it became clear that the movement was coalescing around the Soviet, which was beginning to wield considerable power, and also gave a conduit for interaction with the people. To take control there would be a 12 member committee created and it would be called, and this is a hell of a name so stay with me here Temporary Committee of Duma Members for the Restoration of Order in the Capital and the Establishment of Relations with Individuals and Institutions. This would then become the core of the Provisional Government when, on March 1st, the Soviets agreed to support it as the government of Russia. This support came with conditions, but all that mattered was that Russia had a government again, mostly, there would still be some resistance around the city, mostly senior military officers or officials in the old regime with whatever soldiers were still loyal to them. They were slowly mopped up though, with the last hold outs being cornered and massacred in the Astoria hotel. Overall, 4,000 government officials were killed by the revolutionaries. One person we have not talked much about today is the Tsar himself. His fate, even if he did not know it at the time, was sealed as soon as the Duma chose to side with the revolution and with its more progressive members. Alexander Kerensky would give a speech saying that the Tsar must be deposed "by terrorist methods if there is no other way" after which he was cheered. Over the course of the previous years the Tsar had become more isolated than ever before. In 1916 he had taken over command of the armies, meaning that he would be blamed for their constant failures. Early in the protests Nicholas left Petrograd, but before he did he said that he would be going to the Duma to declare his intention to appoint a new cabinet, with the hopes that this move would quell the calls for abdication. However, just a few hours after announcing this visit he instead changed his mind. Instead of going to discuss things with the Duma he left immediately for army headquarters. Before he left the capital he also gave a singed order for the dismissal of the Duma with instructions that it should be introduced if necessary. When it was used later, after the Duma had already joined the revolution they chose to just ignore it, officially breaking the Duma from the Tsar. On March 1st the Tsar left Army headquarters with the intention of making the 500 mile journey back to Petrograd. However, it became clear as they travelled that they were not going to make it to the city due to violence all along the rail lines. Therefore they stopped at Pskov, where the final events of the Tsar's reign would occur. On March 1st he also received a cable from his Chief of Staff, Alexeyev, which basically stated that the army would not be able to support him over the revolutionaries in Petrograd. "A revolution in Russia … will mean a disgraceful termination of the war … The army is most intimately connected with the life of the rear. It may be confidently stated that disorders in the rear will produce the same result among the armed forces. It is impossible to ask the army calmly to wage war while a revolution is in progress in the rear. The youthful makeup of the present army and its officer staff, among whom a very high proportion consists of reservists and commissioned university students, gives no grounds for assuming that the army will not react to events occurring in Russia." With the army apparently abandoning him, Nicholas had no choice by the abdicate. In these situations the crown would generally pass to the son, but the Tsar's son was a sick child, and the Tsar knew that the strains of leading a country would probably kill him, therefore he also abdicated for his son as well. This then meant that the crown passed to the Tsar's brother Michael, who then abdicated as well. The Romanov dynasty, after ruling Russia for hundreds of years, was over. Those who saw the Tsar later that evening while eating his dinner would say that "The Tsar sat peacefully and calm, recalled one of this aides-de-camp. He kept up conversation and only his eyes, which were sad, thoughtful and staring into the distance, and his nervous movements when he took a cigarette betrayed his inner disturbance" In August the Tsar and his family would be evacuated to Siberia out of fear for their lives as the country began to spiral into its second revolution. The family was then denied asylum in England due to the fears of the reaction by the Labour party. On the night of July 16th, 1918, after being moved back from Siberia by the Bolsheviks. The Tsar, the Tsarina, and their five children were all killed. A tragic death, even for a mostly ineffective ruler. With the abdication of the Tsar the February revolution, was over, they had overthrown the government. Now the question became what to do next. In Petrograd the workers tore down the statue of Alexander the Third, in towns all over Russia statues of the Tsar were removed. That did not mean that everybody was ready for the transition to whatever came next. In Petrograd the new government was defined by trying to be whatever the Tsar wasn't, but that was not necessarily what the people in the countryside, many of which were uneducated peasants, thought they were getting. In much of Russia there was just not enough of a political education for people to be able to frame a government that was not headed by a single person, a Tsar, a President, a Premiere, whatever you wanted to call them it was difficult for many to see the difference. This type of misunderstanding, layered on top of the class divisions which were all pervasive throughout the Russian society was about to cause problems. Not to mention all of the problems that had initially led to the revolution, all of those were still there too, and they would have to be addressed. It would be all of these problems that would mean that the new government, the Provisional Government, was going to be in for a very rough ride during the summer of 1917, a ride that we will chronicle next episode.